The annual award is presented to an individual who has demonstrated exceptional service and dedication to The Main Line Chamber of Commerce (MLCC) and the Main Line region (Philadelphia). 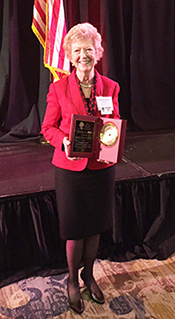 Lenahan received the award during the MLCC’s Red Carpet Dinner in Philadelphia in November. Lenahan stepped into her role at the MLCC 10 years ago, serving as a member of its Board of Directors and Executive Committee, the Society of Professional Women’s Advisory Council, and the Leadership Main Line Steering Committee. She also held the role of MLCC Board of Directors Secretary. As grateful as she is for receiving the Chairman’s Award, there is another MLCC award – one she helped create – that gives her the most pride. During her tenure at MLCC, Lenahan worked to establish the “Helena Devereux Women in Leadership Award.” The award, named after Devereux’s founder, Helena T. Devereux, recognizes outstanding female professionals whose work has impacted the Greater Main Line Region in the areas of business excellence, community service, exceptional women’s leadership and the advancement of employees. The MLCC presents the award during its annual Gold Leaf Celebration luncheon in the fall. Click here to learn more. “I am extremely proud of the partnership between Devereux and the Chamber, and its efforts to recognize deserving women on the Main Line who embody the qualities espoused by Helena Devereux,” added Lenahan. Devereux Advanced Behavioral Health is one of the nation’s largest nonprofit organizations providing services, insight and leadership in the evolving field of behavioral healthcare. Founded in 1912 by Helena Devereux, the organization operates a comprehensive national network of clinical, therapeutic, educational, and employment programs and services that positively impact the lives of tens of thousands of children, adults and their families every year. Focused on clinical advances emerging from a new understanding of the brain, its unique approach combines evidence-based interventions with compassionate family engagement. Devereux is a recognized partner for families, schools and communities, serving many of our country’s most vulnerable populations in the areas of autism, intellectual and developmental disabilities, specialty mental health, and child welfare. Learn more: www.devereux.org.